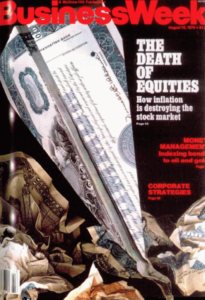 The infamous 1979 Businessweek cover story entitled “The Death of Equities” is widely viewed as one of the best contrarian indicators of all-time. Stocks went on to have one of the greatest bull markets in history not too long after this story was published. But when I read through the original article recently I was interested in another angle. It’s almost like this story was mocking the older investors for sticking it out with stocks after years of terrible performance. Yet the experienced older investors had the last laugh. As everyone is now well aware, stocks went on a two-decade tear from 1980 on with close to 18% annual returns. The Next Gen investor is markedly conservative, more like the WWII generation who came of age during the Great Depression and are in retirement. 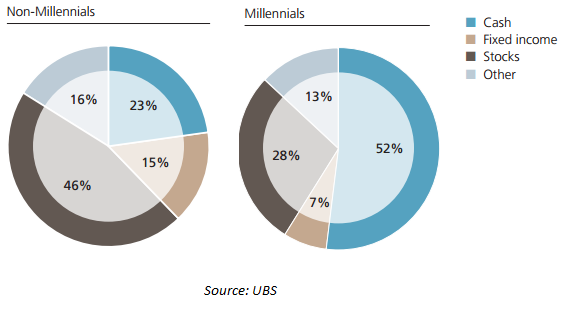 This translates into their attitude toward the market as we see Millennials, including those with higher net worth, holding significantly more cash than any other generation. And while optimistic about their abilities to achieve goals and their financial futures, Millennials seem somewhat skeptical about long-term investing as the way to get there. There is something to be said for gaining experience in the markets by going through many different investing environments to prepare yourself for future possibilities. You learn that the good times don’t last forever just like the world doesn’t come to an end every time there’s a recession or a bear market. Unfortunately, the conundrum here is that it can take decades for investors to become comfortable with the cyclical nature of the markets and their own risk tolerance. Most Millennials saw their 401(k) balance take a huge hit during the crisis or had a friend or family member that nearly got wiped out. Many sold at the bottom which compounded their losses. This leads to the mindset that the stock market is a casino that’s rigged against the little guy. These types of ordeals can leave scars. Equity and bond flows from the past 5 years have shown that many investors sold their stocks to buy bonds under the illusion of safety from another crash. The long-term data shows that stocks are your best bet at beating inflation over a multiple decade time horizon. Yet to earn those higher returns you must be willing take risks. This means at times you will lose a pretty good chunk of your money in stocks. In the end, long-term returns are the only ones that should matter, but this is a very difficult concept for younger investors to accept when they don’t know the history of the markets. 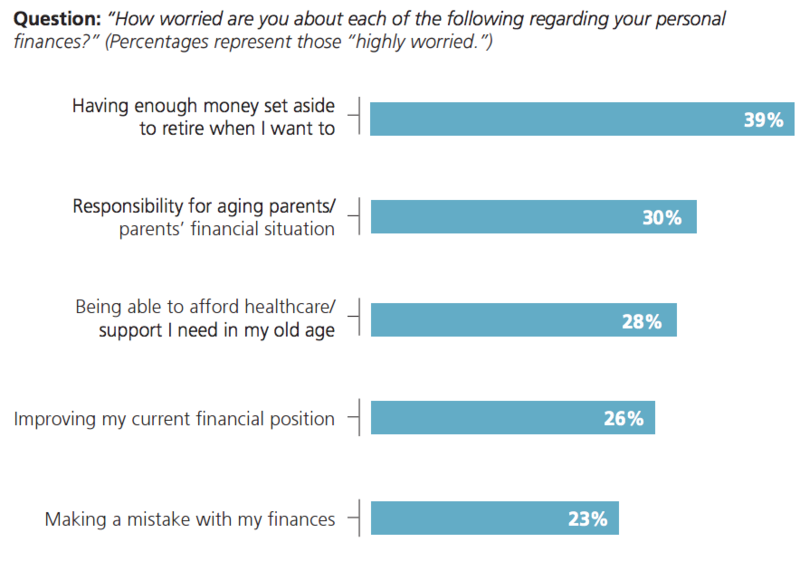 This group has decades until retirement, which happens to be their number one worry (By the way, the last one should not be a worry. Make mistakes when you are young and have time and future earnings power on your side). The biggest assets you have as a young person are your human capital for future savings and the ability to allow those savings to compound over many years. I’m not sure what it’s going to take to get my fellow Millennials to understand that their aversion to stocks will only make it harder to achieve their financial goals in life. The unfortunate reality is that it takes investors time and experience to learn about how the markets work. The stock market doesn’t care if young people invest or not. It’s not going to wait around until you get more comfortable taking risk. Those that invest increase the probability of reaching their goals while those that don’t risk falling behind. The fact is that the best way to build wealth for the majority of people is to slowly invest over the long-term and let compounding do most of the work for you. Somehow this gets lost on younger investors.